The principle idea is to impose U.S. income taxation on U.S. sources only for U.S. citizens residing overseas. The report leaves many unanswered questions. One of those questions is how to integrate the “expatriation tax rules” into such a concept? There is one sentence addressing this point, which contemplates the “mark to market exit tax” will continue as part of the law, if such a proposal were to become law. The report does not discuss how the U.S. transfer tax system (U.S. estate, gift and generation skipping transfer taxes) might be reformed. Current law, imposes worldwide U.S. estate, gift and generation skipping transfer taxes on the worldwide assets of a U.S. citizen. Time will tell if such a proposal gets any political traction in Congress or at the White House. Will Congress and the President Finally Act in 2015 to Repeal or Modify U.S. Citizenship Based Taxation? U.S. citizenship based taxation has been the law since its origins from the U.S. civil war. See, The U.S. Civil War is the Origin of U.S. Citizenship Based Taxation on Worldwide Income for Persons Living Outside the U.S. ***Does it still make sense? Throughout most of the last 100+/- years, there has never bee n a repeal of U.S. citizenship based taxation. Indeed, it is difficult to locate any legislative proposals from years past (if there were any) that proposed such a modification. Third, a little over a year ago, the Senate Finance Committee, which was then controlled by Democrats identified U.S. citizenship based taxation as an international competitiveness issue. See, Senate Finance Report on International Competitiveness Identifies Possible “Expatriation” Reforms for U.S. Citizens Residing Overseas. Will U.S. citizens who live outside the U.S. find any relief soon? This is the first time in my career, where both political parties and the President are at least talking about the possibility of tax reform in this area. There is one key piece of the legislative puzzle missing from the above picture. The House has not weighed in on a proposal to modify substantially or repeal U.S. citizenship based taxation. See, former House Ways and Means Committee Chair Camp’s proposal to modify substantially international tax policy and rules (Making America A More Attractive Place To Hire and Invest: International Tax Reform). These House proposals do not include U.S. citizenship based taxation reform. In addition, I am not aware of any Democrats in the House who are pushing such a reform. Even if there is approval in both the Senate and with the President (as there has been in other major legislative reform proposal, such as immigration), it is entirely possible the House will block any such U.S. citizenship based tax reform. What Collection Efforts (if any) will the IRS Undertake to Collect U.S. Income Taxes from the Gain from the Sale of the London Mayor’s House? What Collection Efforts will the IRS Undertake to Collect U.S. Income Taxes from the Gain from the Sale of the London Mayor’s House? U.S. citizens and lawful permanent residents (LPRs) residing overseas must always consider what collection efforts the U.S. government might undertake for taxes owing. I have posed the question regarding the London Mayor, Boris Johnson, since it raises a number of unique issues. First, under the law, the IRS should administer Title 26 the same for high profile, political, non-political, educated and uneducated individuals. In practice, the judgment of a particular Revenue Agent (and his or her manager) often weighs into how a case is pursued; or not pursued. The fact that Boris Johnson is a public individual, does impose certain limitations on the ability to investigate his particular case. That is largely because of Department of Justice policy. As explained in the last post, only the Tax Division of the Department of Justice can authorize warrants of public officials, which presumably would extend to London Mayor Boris Johnson. See, 6-4.130, Search Warrants. 1. INFORMATION – The collection of asset and financial information under FATCA has a very “long arm” around the world. Indeed, the image of the Uncle Sam octopus published in the June 28, 2014 article in the The Economist entitled Taxing America’s diaspora: FATCA’s flaws captures well the idea of the reach of FATCA. 2. INFORMATION VS COLLECTION – However, enforcing tax assessments and penalties and collecting against assets located outside the U.S. is a very different legal question, without such a “long arm”; simply because the reach and jurisdiction of U.S. law is necessarily limited and regularly in conflict with local laws of different countries. To say it another way, Uncle Sam can indeed enforce the collection of financial and asset information under FATCA, due to the economic costs and ramifications to financial institutions and their investors if they did not comply with the automatic information exchange. However, Uncle Same cannot simply enforce the collection of U.S. taxes and penalties through the worldwide financial institutional network, the same way it can in the U.S. The U.S. has broad lien, levy and seizure powers under U.S. tax law. The IRS can simply seize assets from U.S. bank accounts without going to a judge or court for final (or jeopardy) tax assessments provided they comply with various provisions of the law. This is not a typical concept in the law for other creditors (other than the IRS) who must generally first take steps through the courts to get some type of judicial action (e.g., a court order) before simply seizing and taking assets from an individual. The IRS’s broad lien and levy powers against assets, however, has significant limitations overseas. 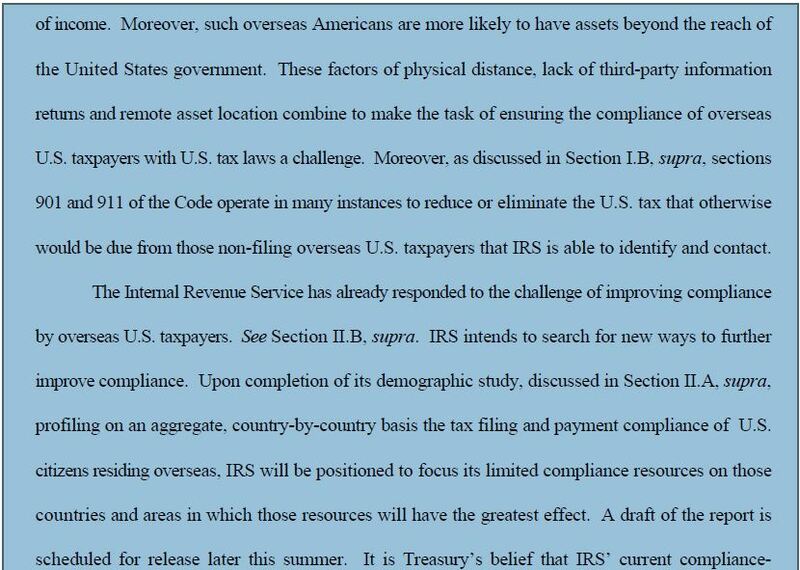 See the 1998 Treasury Report – Sometimes Old is as Good as New – 1998 Treasury Department Report on Citizens and LPRs, I hav e worked with IRS Revenue Officers who specialize in international collection matters who argue and assert they can merely exercise this lien and levy power overseas against foreign financial institutions. However, this is where the power of the IRS comes to a screeching halt (or at least a major slowdown); when the collection of overseas assets is at stake. The IRS is not without remedies to collect foreign assets, but it is not a simple process; if it can be done at all in any particular circumstance. Time will tell, how this tool is used in practice against U.S. citizens residing overseas; particularly those with accounts in various banks that have been the highlight of U.S. international tax evasion investigations, such as UBS, Credit Suisse and HSBC (see, The Guardian, US government faces pressure after biggest leak in banking history).